Laurent Chareau was working in Paris in a former life. He used to come at Didier Dagueneau for each harvest and make the meals for the harvesters there (50 to 70 people to serve, and I think these pickers became spoiled and won't harvest anywhere else...). And that's where he met his future wife, she's Nathalie, the woman who runs the office of the winery. He left Paris and settled in the region, in Cosne-sur-Loire where he found a restaurant to re-start two years ago. The restaurant is located in a bland street of Cosne-sur-Loire, a town on the other side of the Loire from Sancerre. The restaurant room doesn't flash and hasn't gone through luxury remodeling but the food is just great, and this, at very affordable prices like 20 € for a full lunch menu. The wines are well chosen with of course many of Dagueneau's cuvées which are not overpriced like it often happens in restaurants. The place is where many vignerons come to eat. It has already been spotted by several guides including Le Fooding. Try the Risotto froid au jus de crevettte for entry, both the texture and the lightly spicy feel are great, and as main course the choice is also arduous. The roasted-calf rôti de veau as main course was exquisite, with a vibrant aromatic experience brought by all the elements going with this dish and by the long cook in the oven. The chef is easy-going and relaxed and it's a pleasure to have him come at your table a few minutes. What followed our Domaine-Roulot visit a couple months ago was a coincidence beyond belief. We were cruising on a small road winding uphill across the Meursault vineyards, there were nobody around, this was lunchtime and people like to eat in Burgundy. We stopped for a few pictures, we were passed by another car which stopped further up on the road, in a spot where we stopped again to take a look and eventually snap pictures, and we realized that the driver was Bumpei Someya, this ex- Guy Savoy sommelier (see here and here) who came to work at Le Chassagne in Burgundy to be closer from an exceptionnal wine region (he's not an exclusive Burgundy types btw). And he was there wandering by himself in the vineyards, taking pictures, learning to recognize the climats and so on. He didn't know that we were around in Burgundy that weekend. He had already told us that he did spend his free time to learn everything on the estates and the vineyards, but seeing it from our own eyes was particularly impressing. This guy knows already so much on the different style work of the estates. He doesn't work at Le Chassagne anymore and he was hired by Domaine Dominique Laurent where I guess he'll learn even more on the trade... He showed us a small vineyard near the top of the slope just under the wooded summit where he came regularly, as if he wanted to solve the mystery behind its outstanding wines : this plot was Coche Dury's Les Pérrières dessus [find them on the precise Meursault map from Burgundy Report]. He volunteered for the harvest there once just for the sake of learning anything he could by sharing this important stage. The vines are young massal selections and in spite of their youth, the wine, he says, is incredibly beautiful, one of the best wines of the world, he says, looking intensely to the vines and the burgeoning buds. He looks at the pruning and says that it is very well done, there's a secret in this vineyard that he wants to discover, so as to understand how this wine can be so great... There's undoubtly a Drops-of-God (the wine manga by Yuko and Shin Kibayashi) feel, here. Montlouis Chenin tastingThe association of the Jeunes Vignerons de Montlouis (young vignerons of Montlouis) recently held a tasting in Paris. The event was organized by Christine Ontivéro who is a Perpignan-based press agent in the wine field. It took place in a restaurant that I discovered for the occasion, L'Ebauchoir in the 12th arrondissement (43 rue de Citeaux), a venue with a nice wine list and if I consider the quality of the free buffet for this tasting, quite a nice place to eat too [free advertising as usual]. of méthode originelle), in méthode traditionelle (a different type of sparkling, similar to the Champagne one), and the still Chenin wines. If you're physionomist, you'll see some familar faces in this video on the left, like Anne-Françoise Blot (Jacky Blot's daughter) or François Chidaine (who created the group but left it as he is over 40 now). Very nice tasting, and its small size and number of displayed wines allowed for a real enjoyment of all these wines with the time to speak with the vignerons. the tasting started at 4pm and after a couple of hours there was this great buffet prepared by the restaurant, and maybe at 6pm there was this bottling of Montlouis sparlikng (Pétillant Naturel) from a cask of Chenin specially transported here from the Loire. Bertrand Jousset who makes wine i, Husseau with his wife Lise told me that the wine had reach its ideal bottling moment somewhere in january and that it was kept at 2°C to "freeze" it until this tasting. You have to know that a Pet'Nat (a méthode originelle) is a sparkling made without addition of sugar or any other thing to set off the second fermentation : it is a wine which is bottled while the first fermentation is not finished yet. __Lise & Bertrand Jousset Bubulle, Montlouis Pétillant Originel 2008. Very nice mouth, charcacter type of wine. Length. __ Alex Mathur les Pions Montlouis Pétillant Originel. Very nice mouth again, lightly woody, nice length. __ Les Loges de la Folie (Valerye Mordelet & Jean-Daniel Kloeckle) la Nef des Fous Montlouis 2008 sec (dry). From vineyards aged between 60 & 100 years. Clear wine with green reflections. Very refined nose. Cristal-sharp mouth, minerality. 11 €. 2-hecatres vineyards, a blend of. 14 month élevage in casks. __ Grange Tiphaine (Coralie & Damien Delecheneau) Clef de Sol Montlouis sec (dry) 2008. Very beautiful wine. Nothing to say, I like it. __ Lise & Bertrand Jousset Premier Rendez-Vous Montlouis sec (dry) 2008. Nice complexity here. Served not cold enough though. Glides well along the mouth and the throat. Nice structure. __ Chateau de Pintray, Clos de Pintray 2008, Montlouis demi-sec (semi-sweet). Beautiful nose, flower aromas, precise. That's a more recent thing, but does a month or two count here ? The Loire is a very wide wine region and many of its sub-regions are cheap enough on the real estate matter to make it relatively easy for young vignerons to settle, and many of the natural-wine movement chose this region. Sometimes you come across vineyards that are literally turning back to wilderness after having been abandonned by its owner or by the heirs of its owner. This particular video was shot in the Touraine, and I think that it was formerly a farmer's private vineyard which may have been let alone because of health reasons or decease. It's particularly spectacular to see trees growing between the rows, like here silver birchs or firs. How many years since this plot went on its own ? 5 years, 10 years ? Something like that i think. It's nearly as poignant and nostalgic as an abandonned industrial site (for those who like me are fond of industrial graveyards) and there are indeed some similarities. A Tequila introduction in ParisLa Maison Du Whisky (LMDW), which is a French heavy-weight in the whisky imports and retail business, has organized recently a special Tequila tasting. Called Tequila 100%, the event was set in the 9th arrondissement in Paris, in a lightly remodeled former garage which is the workshop and office of François Muraccione, an architect. I arrived at the rue des Martyrs address a few minutes after the beginning of the event at 7:30pm, there were already quite a few people near the tables. The mood was relax and open, no connoisseur's pressure here, you were offered a cocktail to begin with (margarita like), and you could then taste at a few tables among the available Tequilas. I began with an Excellia Tequila, Excellia Reposado, a bottle which sells here at 47 €. Not convinced by this first sip, quite burning feel. It takes the 4th sip to begin to be appreciated. I'll not choose this one. The second table I went to was Ocho Tequila's which comes from Los Altos in Jalisco, and that was good indeed. I first had an Ocho Blanco, a non-colored (call it white) Tequila which sells for 30 € in France. The nose is refined Quite intense and smooth at the same time, even if it burns a bit along the throat. Good stuff. The 4th one was an Ocho Anejo Tequila, a 100% Blue Agave Tequila aged one year in a 600-liter cask. Aromas of zan and liquorice. The next table was Jose Cuervo's : I had a sip of Jose Cuervo Platino, a "white" Tequila with a refined nose and scents of eucalyptus and this sort of hot-climate trees. Very nice indeed too. Then Jose Cervo Reserva, a blend of different years but on average it's 5 years old. Aged in oak. An intense and silky Tequila, that's great. Then, at the 4th table : Arette basic (white). Beautiful, silky and strong. Also a very nice Tequila, with encense aromas and other hard to define but nice petrol scents. The last : Arette Reserva del Senor. Aged 18 months. Gorgeous golden-yellow color. A bit short in the mouth (does it count for Tequilas ?) but nice drink. Smells the rod pavement under the sun (sounds weird but that's a nice experience here... exotic leaves, like laurel's. The event was marked by the intervention and speach by the colorful Mexican Ambassador of Tequila in the whole of Europe : Fernando Cano Trevino is the man of the Tequila Cartel in Europe, sort of, he is based near Geneva and works fo a better understanding of quality Tequila in the old continent. He can be seen on the right speaking to the attendees from the platform. Domaine Pierre Vaisse I tasted the wines of Domaine Pierre Vaisse at a small tasting event named Papilles & Pupilles which took place at La Maison de L'aubrac, rue Marbeuf near the Champs Elysées. This 15-hectare estate was selling all their grapes to the coop since recently and they now bottle their wine from their most qualitative vineyards for a surface of 3 hectares. Liked much what I tasted here. __ Domaine Pierre Vaisse, L'Aphyllante 2007. Coteaux du Languedoc. 80 to 90% Mourvèdre, the rest is Syrah. Nice complexity. Very nice power feel in the mouth. Also a very nice wine. Soil is limestone, pebble stones, the Syrah is on clay. 10,95 €. Another estate that I ked much in this tasting was Coume del Mas, from Banyuls. They had a wide range of wines but I tasted 3 oth them, all of them nice. __ Coume del Mas, Schistes 2009. Collioure rouge (red).This wine isn't racked yet. Some reduction. Sorry, no notes. 10,9 €. __ Coume del Mas Quadratur 2008. Vineyards in the valley of Coume del Mas, different expositions. Grenache, Mourvèdre, Carignan. Very nice nose, fruit notes, blueberries, crystallized quince. The mouth is concentrated, after the glass has been whirled, lots of complexity. 16 €. __ Coume del Mas Collioure, Consolation, The Dog Strangler 2008. 100% Mourvèdre. Grape macerated in casks and then pressed. Nice wine. 19,5 €, prof price also I think. This isn't as well-known as Chez Yvonne, but I consider the place a must-visit restaurant if you spend a few days in Strasbourg. Stuck near a WW2 blockhaus in an out-centered part of town in the vicinity of the harbour on the Rhine, this restaurant is like a trip into a forgotten world of warmul family restaurants. The single-room restaurant is managed by an old lady named Irène Fien, and once you enter the restaurant, you feel like you've been part of the family for years. Other patrons seem to be local regulars, not bobos at all, just normal people, even working-class people. It's clean, it's cozy, you can begin your evening with a draft beer just to enjoy the scene, but there's a single meal if I understood well, no choice basically, or very little choice. Don't panic, the food is good, we had a gorgeous steak the other day, premium quality, tender and all. But come very early : Irène, who is about 80 years old, wants her evenings and every one must leave the restaurant at 8:30pm. This was at Caves Augé, you moght have guessed, and at the tasting casks there were Anne and Emmanuel Houillon, and Pierre Overnoy. Pierre Overnoy is so discreet and humble that you might think he was some one who was there to help. To remind the facts, Domaine Pierre Overnoy is an estate of the Jura region which makes great wines without using any additives. Their vineyard surface is 14 hectares and they farm in biodynamy since 1997. 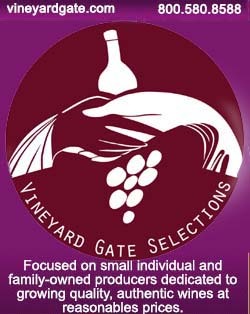 They have a permanent staff of 6 people, 50% for the vineyard work. Emmanuel Houillon who began as an apprentice at the estate, is now in charge of the winery. __Overnoy Poulsard 2009. Bottled next august. Smells linen, says the guy near me. Nice viscosity in the mouth. Taken from a vat, it has almost a cask-elevage feel, but it's been raised in vats and it doesn't need a wood élevage. __Overnoy Chardonnay 2007. Nose lightly oxydative. Vividness, neat wine in the mouth. Wax on the bottle end. __ Overnoy Savagnin 2003 Wax closure again. Oxydative notes à la Savagnin. __ Overnoy Arbois Pupillin Savagnin 1998. The vintage of their Vin Jaune. Indestructible, says a taster near me. Green reflections in the wine. Iode notes, lots of freshness. Lots of dry-extracts notes, which explains this freshness in spite of a high-alcohol probably. Almond notes. Really a great wine to drink and enjoy. Smell these stinking wines ! I already had this sory some time ago but I thought I could write a few more lines about it. this picture was shot at the 2010 Agricultural Fair in Paris, this is at the French Pesticides lobby IUPP (A lobbying group rassembling 95% of the pesticides/fungicides manufacturers selling these products in France). IUPP is an acronym for Union des Industries de la Protection des PLantes, which sounds more friendly than Union of the Pesticides-and-other-harmful-chemicals manufacturers... They had a large stand and installation at the wine fair with the goal of proving that all these products were a benefit for every one, the plant and the people who consumed the fruits orwhatver was grown. For that purpose, they had several convivial and interactive tools intended for the families, like this stinking wine window which was supposed to prove that wines made from grapes that had not been chemically treated stunk. On the sides of this stinking-wine window there a sentence reading : Certain diseases (of the grapes] have an impact on the quality and on the taste of the products. Come near and smell. the hidden part of the story is that some products have an impact on your health when they're sprayed on the fruits and the grapes and find their way as residues in your plate or your glass.. The chemical industry behind the pesticides, fungicides and the herbicides have some good reason to worry for the business : the public begins to question the problem and potential consequences of the chemical residues found in wines produces by conventional wineries and vineyards. When the vineyard is sprayed by chemicals, the plant and the grapes retain some of these chemicals and residues can be found in the wines. A random research was made some time ago by the Pesticides Action Network (PAN) about these residues in commercial wines from different countries available in europe, and the results were alarming. If the natural wines weren't already chosen for their tasting qualities and their vibrant life, that would be another reason to start to worry about what's behind the conventional wines of the business-minded wineries. here is the PAN study (in French), and the results show clearly that 100 % of the conventional wines are testing positive for pesticides residues, whatever country they come from. The organic wines are all exempt of these residues, except one from Burgundy which has some traces in the wine, and it is assumed that it comes from spray drifts caused by wind when conventional and organic vineyards are side by side. This IUPP Pdf document in French) is very interesting in many regards. It is obviously intended to give confidence in the use of pesticides allthewhile giving many precautionary advices for storage and dosage of the products.the sponsors of the document are Bayer, BASF, Du Pont de Nemours, Monsanto among others, the complete list of the 21 companies can be found if you scroll down ("Les Entreprises Adhérentes, page 57). On page 20, they seem to have initiated a counter study regarding the residues in wines after working with several wineries in different regions of France where strict precautionary dosage, storage and spraying modes were followed. the document states vaguely that the residues levels in wine were too low to be quantified and were inferior to the legislation minimum. That surely doesn't mean there's no worry to have here.